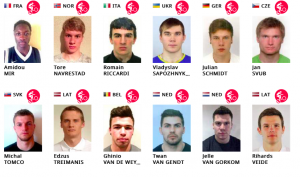 It has to be said that the 2015 European Championships was successful for GB. Especially Saturday in the younger ages groups. GB came away with 4 European Champions. Lucy Hutt, Ralph Grimmit, Luke Shriever and Ryan Martin can all wear that E1 plate with pride. We also have to mention Nathan Wood who led the whole lap until the last jump, he deserved that E1 plate but is sure to be going all out at the World Champs next weekend. You can watch all the action again here. BMX Hype brings you live footage from the first European Games in Baku thanks to BMXLive. The first ever European Games has begun this week in Azerbaijan. 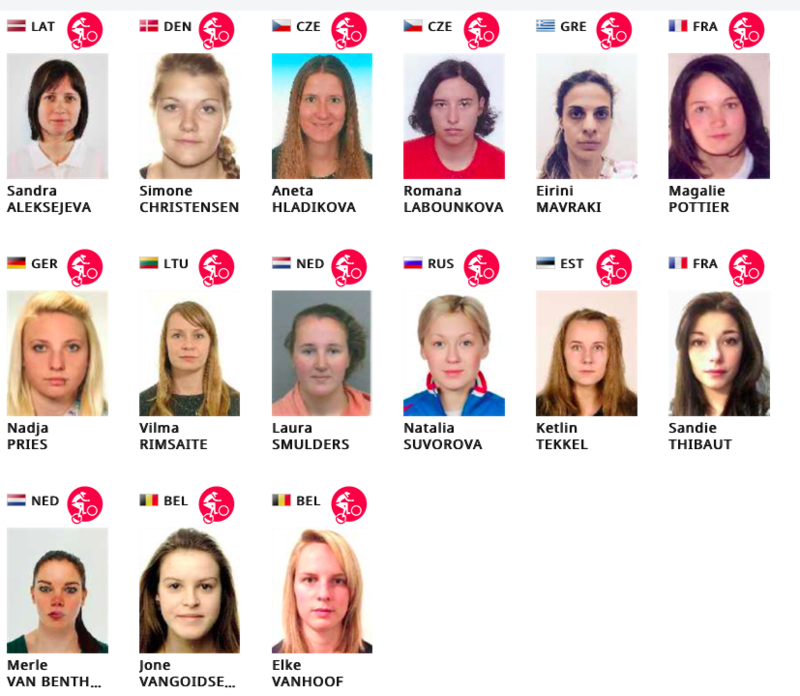 This is designed to be an Olympic Games for Europe with many athletes competing for medals over two weeks. 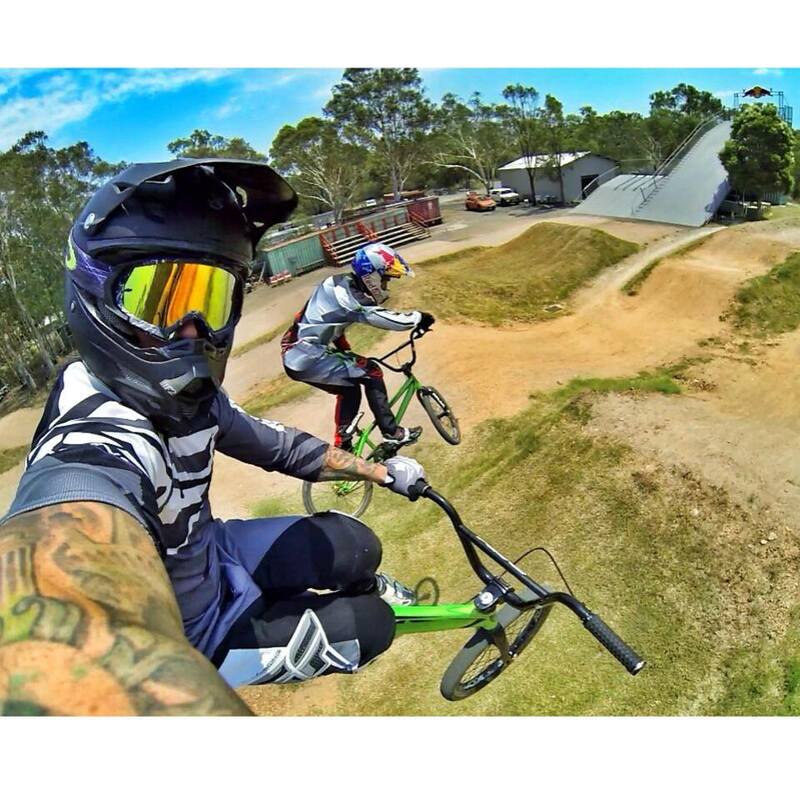 BMX racing has made the European Games with riders from Europe competing for Gold, Silver and Bronze medals in racing. The Time Trial is not going to be a medal event as it is at the World Champs. BMX begins later on in the Games with Time Trials on Friday 26th June, motos on Saturday with the medal races (Finals) on Sunday 28th June. The action is live on BT Sport so if you are lucky enough to have that tune in at 10.30am Friday for the time trials. 10.30am Saturday for the motos and 11am Sunday for Semis and Finals. 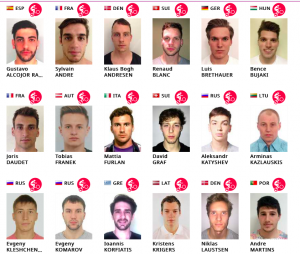 One aspect about BMX at the European Games that has been spoken about is the riders who are attending. Countries were allowed to send two riders who had to have UCI points. For some reason however Latvia and France both have three riders. The Latvians sent Edzus Treimanis, Veide and Krigers. This raised the question of where is Maris? France sent Joris Daudet, Amidou Mir and Sylvain Andre. Other riders to look out for are the Dutch riders Jelle Van Gorkom and Twan Van Gent. No Niek Kimmann for this one. 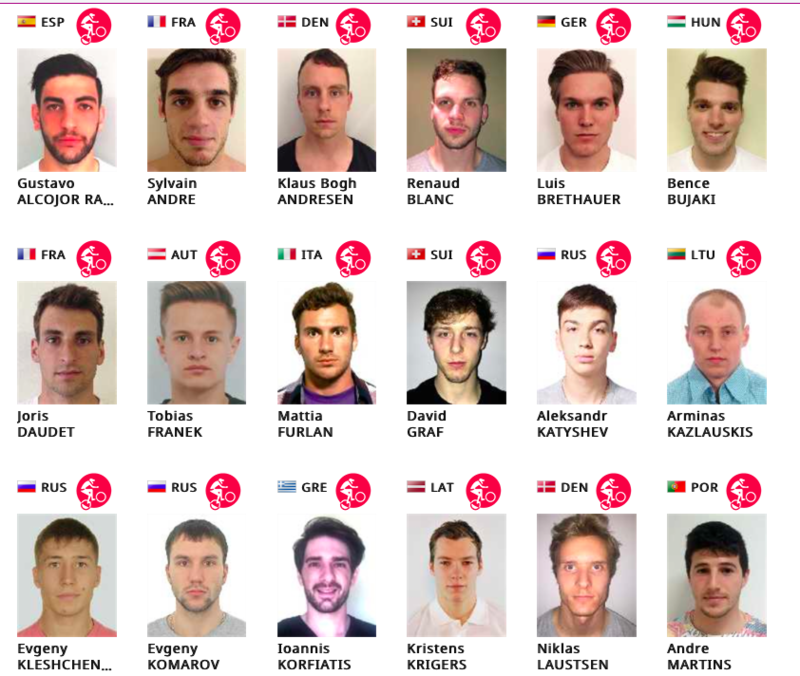 I have to be honest though there are some names in there I don’t recognise and according to the athletes page on the official Baku 2015 website there are only 30 male athletes and only 15 female athletes. BC have had more criticism about not sending anyone to these games but it must be said that they are not the only country to do this. With the World Champs so close maybe the risk doesn’t match the reward however it could have been a great experience for some younger up and coming riders. Another concern especially for me is that this event isn’t being covered by any bookies in the UK. This means one thing and one thing only. An Issitt Schweepstake will be on the cards. I will sell tickets at Peckham National so come and find me at the BMX Hype Team tent. 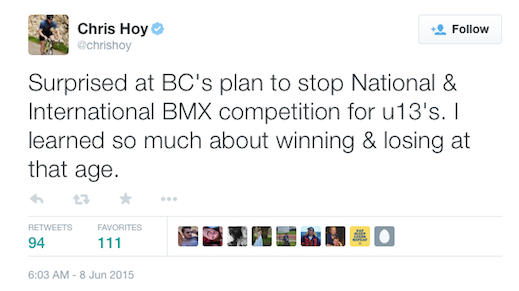 Is the future Bleak for BMX? This new ruling of riders under the age of 13 will not be able to gain points at national level to qualify for big events is a monstrous blow for British BMX. And it is only British BMX. Yes the riders can still race, gain trophies and have ‘fun’ but it is that final aspect that has been taken away, the points, which is making a huge effect on the riders. If you race nationals your next step for progression is international experience and it is experience that our youngster will miss. I do think the current qualification system is flawed whereby some riders can qualify for a world champs without doing a national but that is another topic for another time. BC only have to look at social media to see how passionate the BMX community feel about this decision. 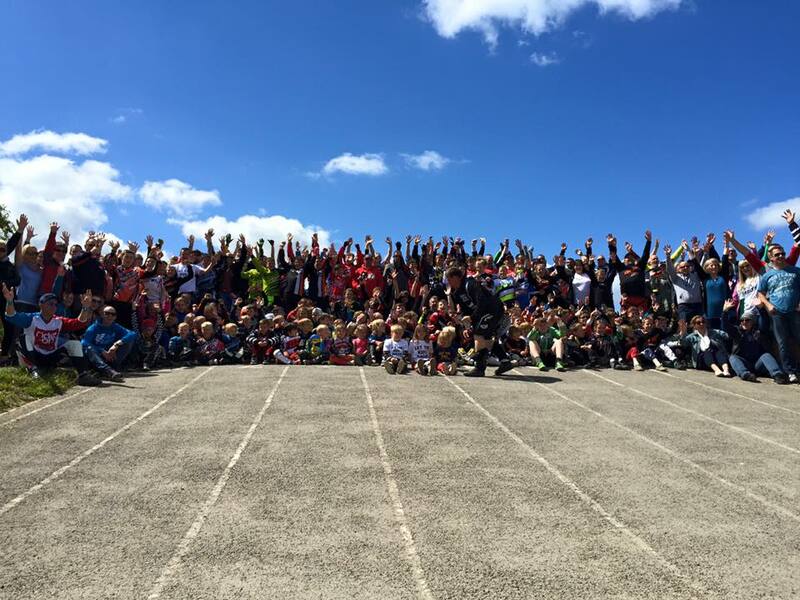 A Facebook page Let the Kids Race has gained over 2800 members within a fortnight of the decision being announced. And if you are reading this and not a member make sure you join. This ruling has come from BC which seems like BMX racing hasn’t been thought of at all. However this decision will have had to come through the BMX commission in order for this to be passed. There are a catalogue of errors that I feel may have been made here. 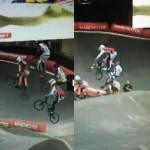 Did they fight enough to say this decision was no way near the correct move for BMX or did they agree with the fact riders were under pressure, not having fun or peaking too soon? 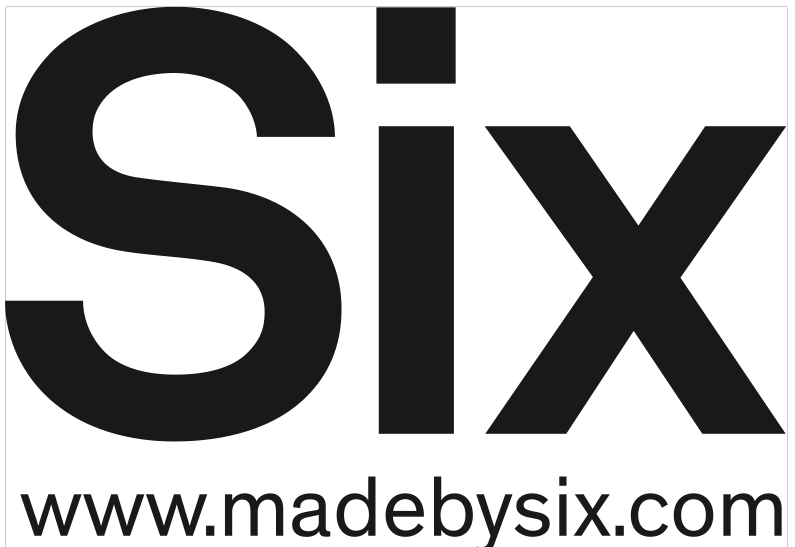 Your BMX commission members are; Grant White, Tony Luckhurst, Mal Gilliat, Paula Hallet, Julie Watts, Phil Townsend and Dylan Clayton. It may be worth getting in touch with these people to see what they thought of the decision. The thing I find strange is that the NSWG (National Series Working Group) didn’t know about this decision when two members on the NSWG are also on the BMX commission. There surely has to be a breakdown in communication here or someone has been hiding something. One thing we know for definite is that the current government are trying to push for more competition in primary schools so surely BC are going in a completely different direction with this new ruling. What are the reasons behind all this? Riders are not having ‘fun’ and from all the pictures I am seeing over social media this couldn’t be any further from the truth. 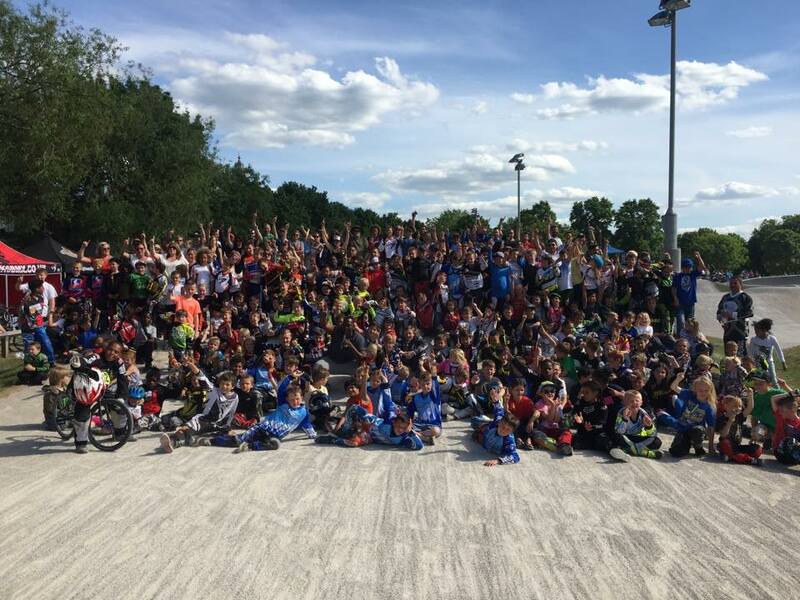 I started BMX racing at 3 years old and have great friends in BMX many are who are foreign that I have met by being abroad racing 2,3 times a year since the age of 7. I really feel for the youngsters that will miss out on this experience as well as gaining valuable racing experience and even W and E plates along the way. Pressure, that being parents putting it on the kids to win or even the pressure of having to go to a national to gain points to qualify for the major events. This one is crazy for me, you need pressure in order to succeed, it has to be the right type of pressure though. Yes, there maybe one or two out there that go crazy every now and then but you get that in any sport. It’s being able to handle the pressure that makes good riders great and the earlier you control it the better. I’ve also seen the argument that riders will peak too soon if they are competitively racing from an early age. Jamie Staff wrote a great piece on this about BMXers peak around 21-25 years old, which only gives them 8 years to master the trade. 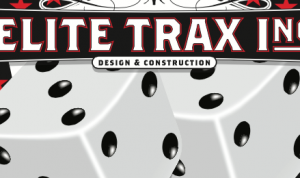 Another great one I’ve heard is about this may reduce the drop out rate in BMX. Wow, really! In my 24 years in BMX I’ve seen numbers drop and rise again, massively in recent years, surely this ruling will accelerate the drop out rate but I guess time will tell. Well as I mentioned earlier the BMX community have rallied together against the decision getting press involved in the form of newspapers, radio and even the possibility of ITV news. 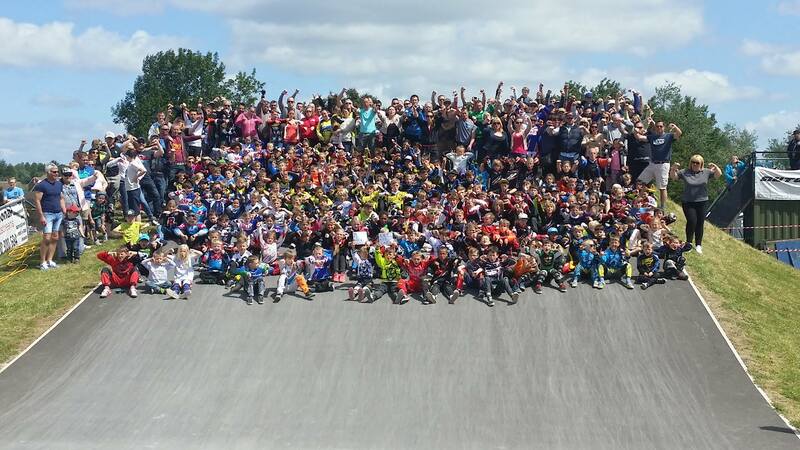 All this to raise awareness all over the world about BC and BMX at world champs and euro events having no riders aged under 13 from GB. Some big names from the BMX world have been involved; Dale Holmes (multiple world champ for GB), Jamie Staff (Multiple world champ for GB and now Team USA coach), Tim March and even Sir Chris Hoy got involved with this tweet. GBs most decorated cyclist who learnt his cycling trade in BMX under the age of 13. MPs have also begun to sign the petition that was created currently over 3000 signatures. At recent regionals pictures have been taken of the riders who are affected by this ruling. 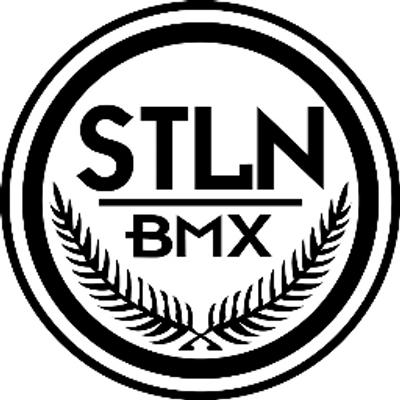 Lets not kill BMX racing! There was an Olympic legacy remember. Three of the BMX Hype team headed to Rhyl for a little session. We was joined with a blast from the past Dan Sobutta. When we got to Rhyl the track was decent as you would expect from any Clark & Kent build but the when we discovered the pump track WOW!! What a place, YOU NEED TO VISIT IT!!! 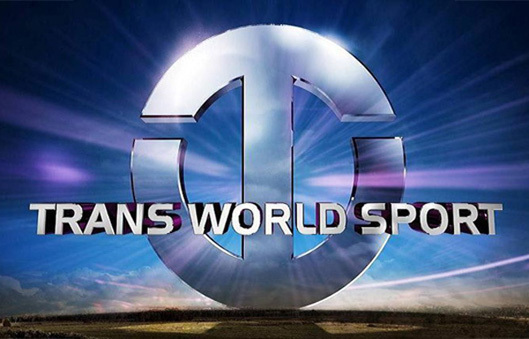 I grew up watching Trans World Sport and seeing BMX racing getting more and more recognition is only a good thing. Manchester World Cup SX seems a while ago now and we are readying ourselves for Rd 3 in Engelholm, Sweden. If you missed the 7minute clip here it is. It really shows Liam’s dominance over the past few years at this event. Well by now everyone in the UK knows that Liam Phillips was crowned king of Manchester after going three years unbeaten at the World Cup event at the NCC. However that wasn’t the only thing that went on in an action packed weekend of racing. Racing around the Manchester track only lasts around 30 seconds but really throws up some exciting action. With almost every race resulting in a crash for one rider, blink and you missed something for sure. In this piece we will give you the low down on who won, how the GB riders got on, who crashed the biggest and some great pictures from the weekend. Well, lets start where everyone else has… Liam Phillips. The man it seems simply cannot be beaten on his home track. Winning the Time Trial Saturday ahead of Connor Fields who was the only other rider to go sub 29seconds. Sunday was no different for Liam. He was flawless throughout his three heats, quarter and semi final where he met current World Champ Sam Willoughby. Sam looked to have the snap in the Semi but Liam powered past down the first straight. The final was no different Liam got the holeshot with Sam in two. Nic Long was on fire all day especially with a serious first straight pull. Willoughby went down on his own which seemed to slow Long up allowing Frenchman Amidou Mir through for a 2nd place. Check out the Final below. Team GB are becoming a force to be reckoned with. Quillan Isidore, Kyle Evans, Tre Whyte and Charlotte Green all made it through to Sundays racing. Kyle had already qualified thanks to last years standing. Tre, Quillan and Charlotte qualified through the qualification motos on the Saturday. Unfortunately Paddy Sharrock and Ryan Hutchinson didn’t make it to Sundays racing. 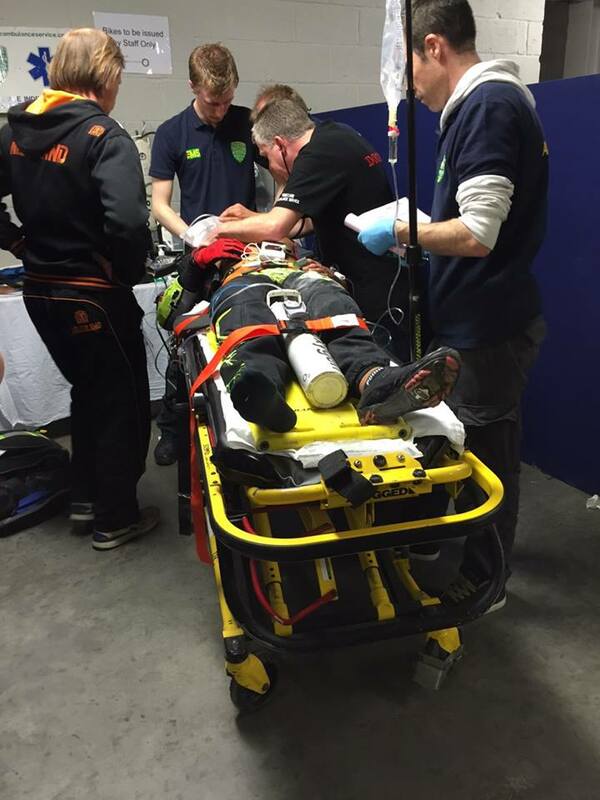 Ryan Hutchinson didn’t make it to the gate on Saturday after suffering from food poison. 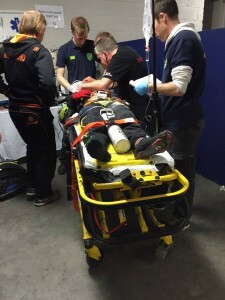 Paddy on the other-hand was the most unlucky rider going on Saturday. Paddy was one of 12 riders who finished on 11 points after their three motos. With only two spots available to make up the final 64 riders going through to Sundays racing it meant it was left to count back. The way in which count back works in SX events is that your final lap time will go against those on the same points result in the fastest being placed ahead of the others. Paddy’s final lap time was the third fastest behind Brodi Turner and Quentin Caleyron. It got worse as Paddy missed out by 0.006 seconds with a time of 30.479 seconds and Caleryon’s time being 30.473 seconds. Onto Sunday, more bad luck rained down on GB and this time it was Quillan Isidore. Quillan crashed in his first moto sliding out in the last corner. He was back for his second and ready to make amends and was looking like he was going to until a big crash into the first corner. Fair play to Quillan as he was up there and good to go for his third moto which I definitely wouldn’t have been but then again thats another reason why Quillan is where he is, he has a great determination to comeback from anything. Quillan seemed to hang back down the first straight for a clean run at the second straight but it wasn’t to be as he collided with Dutch rider Jay Schippers after the big step-up. This left Quillan dragging his bike off the track at which point I would have probably left it and sulked. Kyle Evans had a good day but he was not happy. He wanted to make the main but just fell at the final hurdle getting a 5th in the semi final. When you look at that semi final there were some huge names that also went out. Connor Fields, Carlos Oquendo and David Graf also bowed at in that semi final. Kyle was on fire claiming a 3rd in his quarter final and qualifying 1st out of his moto with a 1st, 2nd, 1st. Kyle was also involved in the Time Trail on Saturday night in which he finished in 6th place. Again Evans was not happy with this as he said he messed up his second straight. I wouldn’t mind messing my second straight and still being faster than Sam Willoughby and Maris Strombergs. 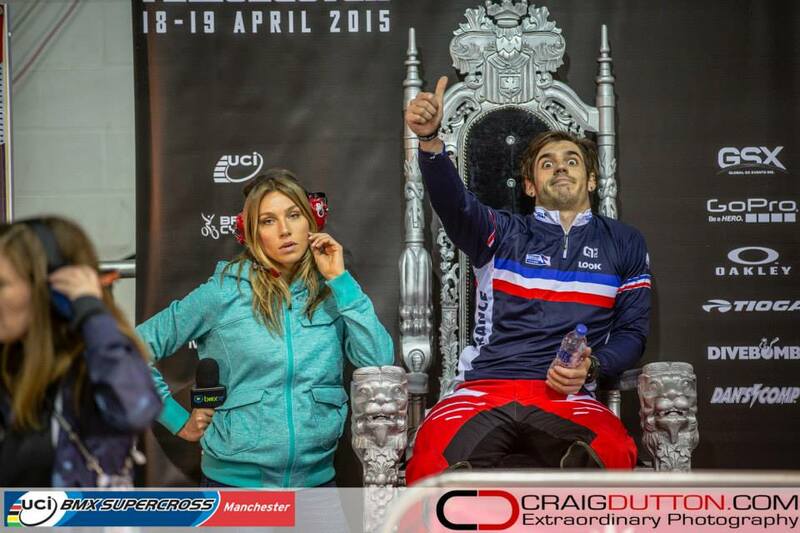 Tre Whyte followed up last years World Champs success with a good start to the World Cup SX series. Tre made the main event after finishing 3rd in his semi final. Tre looked like he was going to make the podium as he pulled Nic Long in on the second straight. Long boosted the double into the second corner which left Tre nowhere to go other than into the back of him causing Tre to go down. Tre dusted himself off and finished 7th place. Charlotte Green was looking good on Sunday qualifying out of her motos thanks to the countback rule. Semi final is where her day ended though as she finished 7th going out with Felicia Stancil, Lauren Reynolds and Amanda Carr. This is a new introduction to the 2015 World Cup SX series. Basically this kicks in during final time to goad riders into picking gate 8. If a rider picks gate 8 in their final and wins they double their prize money. From the Elite Men and Women finals on Sunday no rider decided to take gate 8 despite Max Cluer’s best efforts to tempt them, instead it was left to the rider with last pick to take gate 8. I’m not sure what the coaches would say if one of their riders would have chosen it. But I guess time will tell and if a track better suits gate 8 who knows. 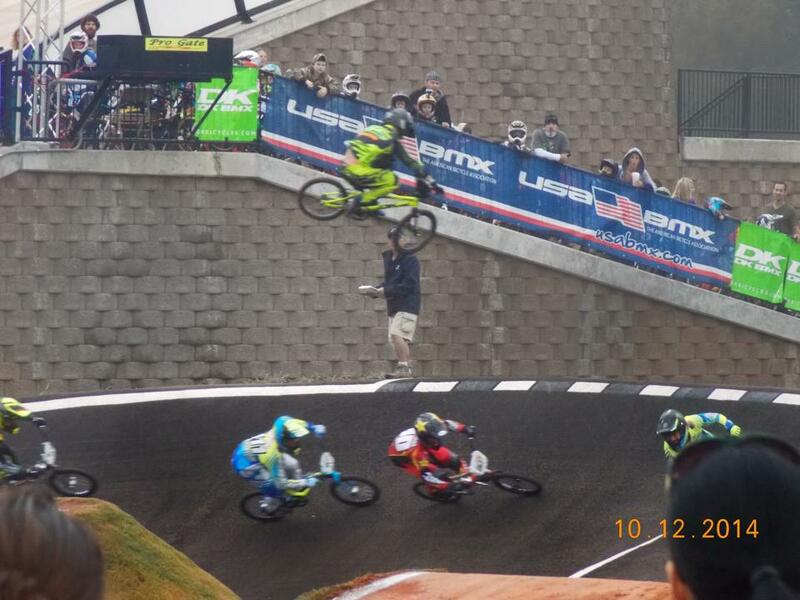 Wow… there were some huge crashes over the weekend. I will start with a good friend of mine Robin Van Der Kolk. You might know this name from the challenge classes, he is the man who won three back to back W1’s in 17-24 from 2012, ’13 & ’14. He then decided to step back up to Elite this year. He crashed twice on Saturday on the third straight in exactly the same place. The second crash was a lot worse. He face planted the final triple landing straight into the jump. Robin says he was knocked out for around 5-10mins and was told he had blood coming out of his ears. Speaking to him on the Sunday with a broken nose and a battered face he wasn’t phased by the crash and enjoyed his time in Manchester. Another big crash from the weekend was two time Olympic Champion’s crash thanks to fellow countryman Edzus Treimanis. Maris Stromberg had to boost the final double on the second straight which left Treimanis almost going underneath Maris flipping him some way from the tarmac. 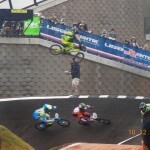 He did get up and race his quarter final but clearly wasn’t right. This picture is brilliant. You have to love Sylvain Andre or Andre as she kept calling him. If you have a spare hour & 45mins and want to watch the whole World Cup SX Rd 1 again then click play on the video below. It’s not very often you put a plea out for someone to come out of retirement but we at BMX Hype felt this one needed to be done. So we asked the BMX people what they thought to this news. Have your say by leaving a comment. What should Laurence Mapp do? from BMX Hype on Vimeo. 2014 World Cup SX winner Liam Phillips did a little something to increase his following even more this week. Liam was a feature in the well known magazine men’s health a couple of days ago. Despite talking about how he has to eat so much to maintain his power output and how big his legs are, Men health still managed to get his top off which no woman will be complaining about! Liam will be part of the May Body Issues 2015 edition and will star alongside some big names in sport such as Footballer Danny Welbeck and boxer Anthony Joshua. 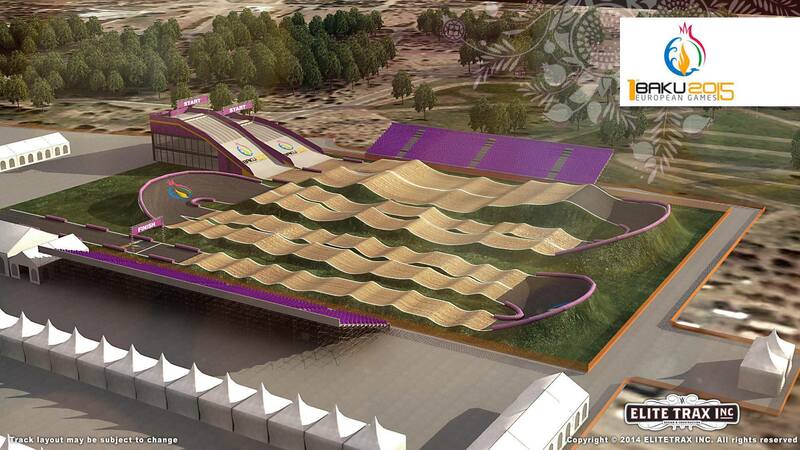 This is surely another great thing for BMX Racing. Here is a short clip of the shoot. Nice one Liam! Not jealous!! Honest! Nobles has to be one of the most stylish riders at this current time in BMX racing. He is not one to follow the rules (which is bad kids) and defiantly gets himself notices. 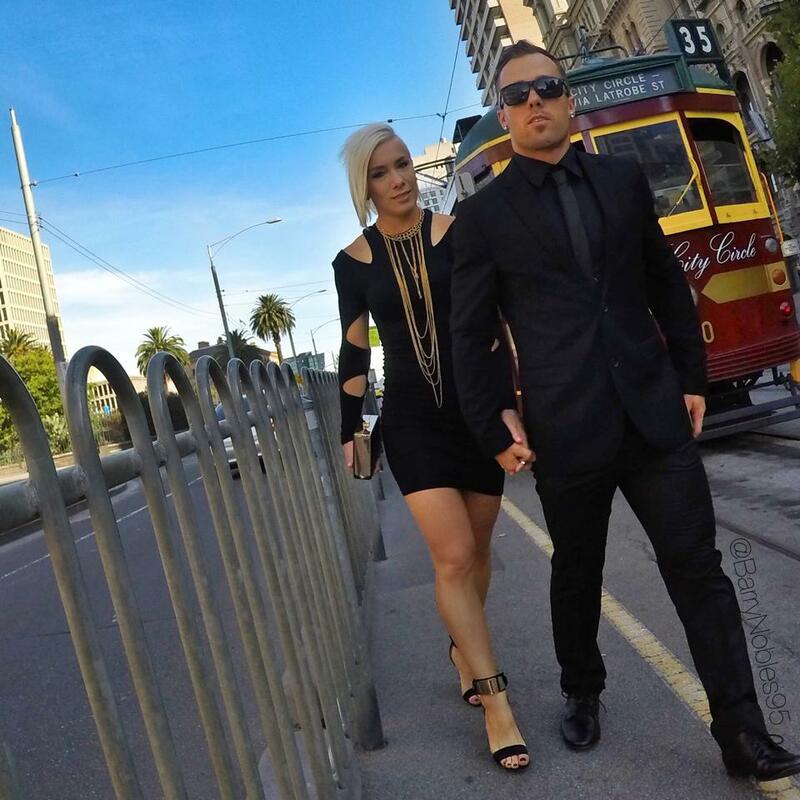 Which also helps if you have a Ex World champs girlfriend like Caroline Buchanan. This time though he has taken it further, not wanting to be sitting still he decided to be towed by a motorbike and jump a 60ft gap, as you do. Well he captured it all for your pleasure.